In partnership with British Council NI and British Council UAE, Science Cube is an interactive project by Northern Irish sculptors Brendan Jamison and Mark Revels. 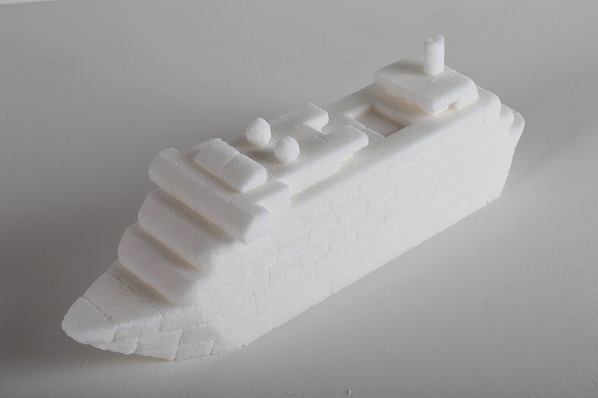 Since 2003, Jamison has been a global pioneer in the field of carved sugar cube sculpture. In 2013 he invited Revels to join him as a sculpture partner and the duo are invited all across the world to create large-scale works which push the boundaries of contemporary architecture and engineering. 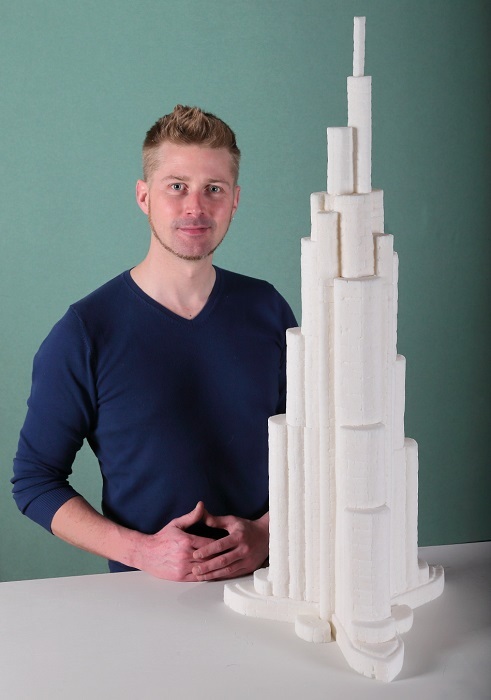 They have created a special sugar metropolis for Think Science Dubai, an event designed to inspire the next generation of young scientists. Sponsored by the Emirates Foundation, the annual event is held in Dubai's World Trade Center from 18-20 April 2017. 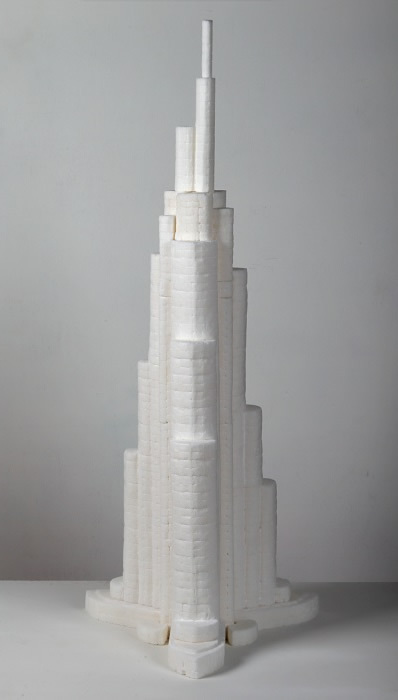 Revels has carved the world's tallest building, Burj Khalifa, which stands at 829.8 metres high and is rendered at a scale of 1:1000 in this magical sugar cube creation. 2017 sees the tower celebrate its 10th anniversary as the world's tallest free-standing structure. With 156 floors, it is a pioneering feat of engineering. The structural design is based on the hymenocallis flower, intelligently combining aesthetics with the science of stability. American Architect Adrian Smith designed a spiralling Y-shaped plan which ascends with 26 stepped tiers. These increments reduce wind forces and prevent wind vortices from occurring over the building. 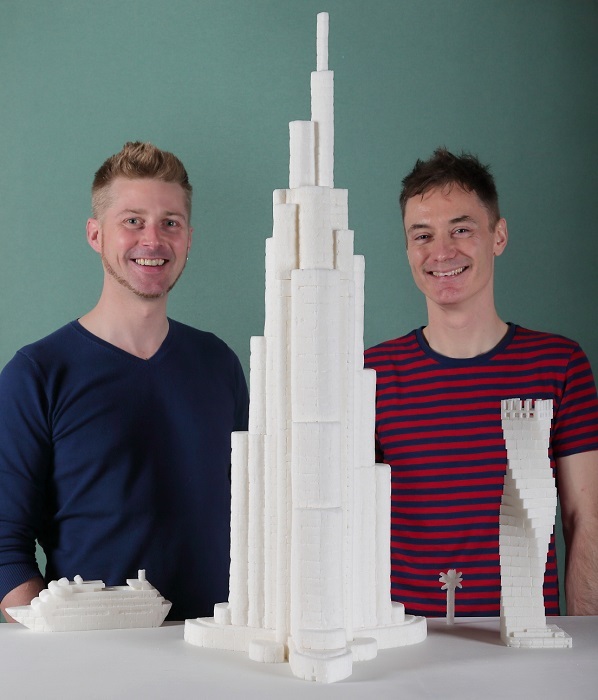 Meanwhile, Jamison has carved the other iconic building in Dubai, the Burj Al Arab, which opened in 1999 as a luxury hotel. Designed by British architect Tom Wright, the structure resembles the spinnaker sail of a J-class yacht and sits on its own artificial island, linked by a causeway to the shore. At a height of 321 metres, the Burj Al-Arab is a colossal construction on sand, with hundreds of 40 metre long concrete piles driven into the seabed to secure a stable foundation. One of the highlights is a round helipad suspended from the roof with a tiny sugar cube helicopter sitting on top! Jamison has also created the twisting Cayan Tower which rotates at a 90 degree angle and stands at 306 metres tall. These iconic structures sit alongside smaller sugar cube carvings of a luxury cruise liner and a tiny palm tree, creating a sense of scale when placed next to the colossal architectural marvels of Dubai. These five iconic symbols of Dubai are displayed alongside a dynamic range of contemporary structures which have been designed by Jamison and Revels. 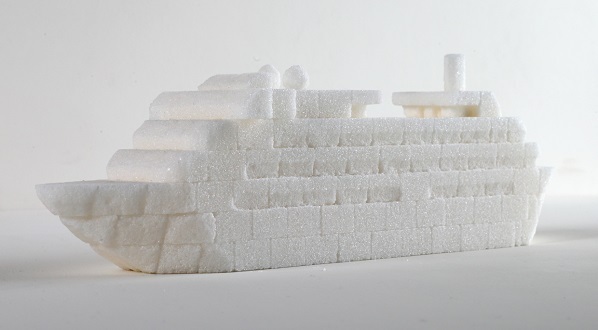 With a strong focus on the future, this educational project aims to inspire young participants to contribute to the creation of the ever-expanding sugar metropolis. During the 3 day Think Science event, the sculpture duo is delivering a one hour workshop every morning and afternoon. In terms of medical science, it focuses on the global health issue of diabetes and then on the science of construction, the workshop explores engineering stability, contemporary design and urban planning. Jamison and Revels are beginning with a short introduction outlining how they construct their sugar city buildings, discussing the role of spatial awareness and the focus on maintaining a balance and harmony of urban planning whenever a city expands. 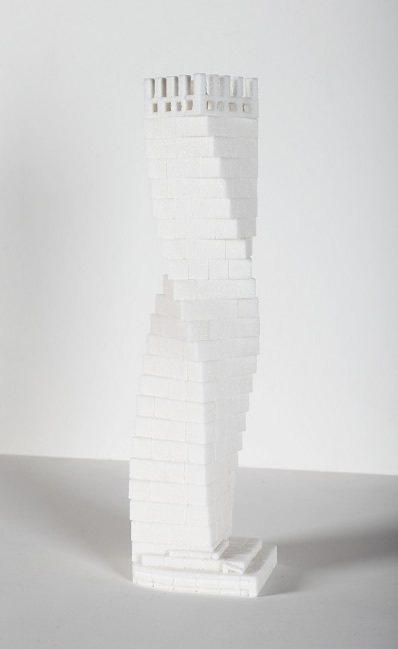 Following a demonstration on the principles of creating architectural forms with blocks of sugar, participants are encouraged to create free-standing structures within the Science Cube installation space. These become part of the overall installation. The project is based on the concept of mass collaboration through a multi-disciplinary approach. Jamison and Revels are driven by a passion for cross-pollinating the worlds of art, design, science, engineering, mathematics and urban studies.